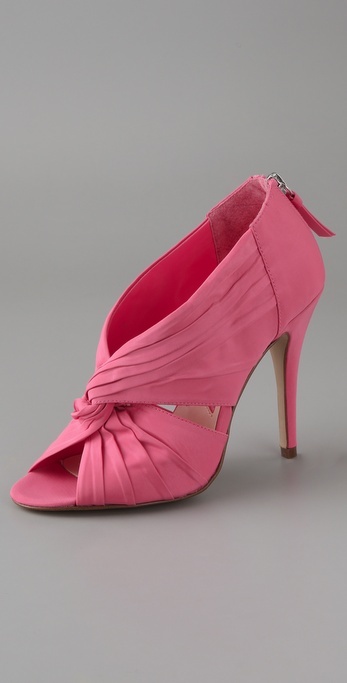 Today's So Shoe Me is the Dejana 2 Taffeta Pumps by Boutique 9, $140, available at ShopBop. Pink will be everywhere this spring and this vibrant bubble gum shade will work perfectly with hot pink or can transform into a neutral when pairing it with other brights. This pump had ladylike charm down pat with a feminine twisted front, luxe taffeta fabric, a dainty heel and of course the quintessential girly pink color. While these can go over-the-top prim and proper with a sophisticated dress you can also make these pumps modern by pairing with bright and simple modern separates. I would pair these with hot pink straight leg pants and a clean-lined chartreuse top for a fashion-forward modern mix of brights. So Shoe Me a pair of elegant heels with super femme details that can go ladylike or, for a twist, can be styled with modern bright separates. Leaving me with multiple options and money well spent.